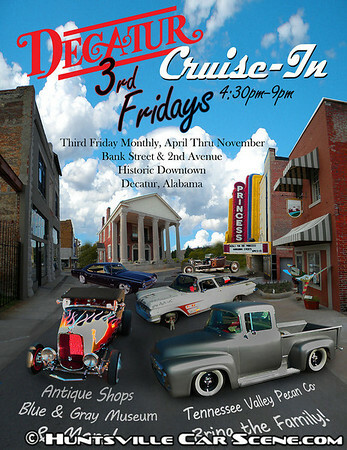 The city has decided to add a cruise in to their 3rd Friday event in down town Decatur. They hope to pattern it after the Gadsden Cruise In. For the time being it will be held on Bank Street just down from the old bank building. When all road work is done on 2nd Ave close to Princess Theater, it may move up there. It will start about 4:30 -5:00 p.m.-ish and go to about 9:00 p.m. Bring the wives as there are antique shops, Civil War museum, Tenn Valley Pecan Co, and more. Restaurants are A Little Slim, Simp Mcgee's, Tim Buck 2 deli shop. 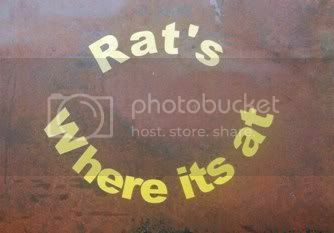 They are working on getting more food vendors in for the cruise. If you know of food vendors have them contact me. The old state bank parking area should be open for photo ops if you so desire. We hope to be able to park in the very middle of the street like Gadsden, but must leave a fire lane. Work with us as this was done on very short notice. Ya'll come. Hope I covered it all. thanks samir.you can delete the "maybe " thread if you want to. Nah, it's just fine. Kinda shows how the whole event started. Looks great! Added to the listing. Last edited by Samir; April 12th at 11:52 PM. Might try to make it, we are going to more of a variety this year. easiest is go up I -65 to 565/20 west.take 20 west to decatur. cross the bridge go to 3rd traffic lite (i think its the 3rd) anyway turn right on lee street. follow it around and it will turn into bank street.come to end and you will see it. be sure to look me up if you come.if you need more let me know.hope to see you. Last edited by b.a.king; June 8th at 06:15 PM. Anyone looking to go to this one? I can easily stop by after work if it looks like it will be a decent turn out. It's always a great turnout. I've been wanting to get to this one since the first one, but it's the same day as the Nissan meet. I plan on being there. Last month the pittman shaft on the Bridgeport broke snapped, and I got it fixed just in time for the coil and ballast to go out. Since then the car's been to Tuscumbia, Murfreesboro and Vinemont, so it should be good for this week. This Decatur 3rd Friday cruise-in has some potential -- great place to have a party. Last edited by A_Cryer; June 10th at 06:52 PM. have you SEEEEN my car? bring it down, love to have it. Mine, too! BA, does your car have door panels or is it nekkid like mine? door handles,just no glass...............or class as the case may be. I cannot believe he is finally admitting it. I will there this Friday Brother. can you find your way,or are you following your brother? you know who! Sounds like a great time! I'm there! '92 Camaro - Turbo LSx 6.0 T56 Swap in the works!